Tone does not necessarily equate tenor. The Hawaii that the characters in Alexander Payne’s The Descendants inhabit is a counterpoint to labored lives led by ordinary denizens of the idyllic archipelago. Lest there be any confusion, this irony is driven home within the first minute of the film by the intrusive voice-over of Matt King (George Clooney), a wealthy attorney who has taken up residence in the hospital room of his comatose wife, Elizabeth, critically injured in a boating accident. Less obvious, but more germane, is the contrast between Payne’s trademark breeziness and the crippling cynicism at the core of his latest portrait of middle-aged angst. Payne is a gifted writer and filmmaker, one of American cinema’s finest purveyors of films with adults themes that are leavened with humor. His deft adaptation of Kaui Hart Hemmings’ seriocomic 2007 novel makes for an entirely watchable, sometimes poignant film that is already garnering critical praise. 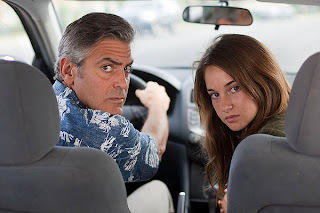 There’s the temptation to view The Descendants as a companion piece to Sideways, Payne’s last film. However, Paul Giamatti’s wine-sipping schlub was a divorcé still desperately pining for true love. In Matt King, Payne – who has personally lived through marriage and divorce since making Sideways – presents a character who enjoys redemption only once his wife is brain-dead and on a ventilator. The wobbly plot finds Matt, his two daughters, 17-year-old Alex (Shailene Woodley) and 10-year-old Scottie (Amara Miller), and Alex’s slacker boyfriend Sid (Nick Krause) on an island-hopping tour to inform Elizabeth’s friends and family they should bid their goodbyes before her doctors pull the plug. This mission makes a detour, however, once Matt learns that Elizabeth has been cheating on him with a local real estate agent named Brian Speer (Matthew Lillard). This personal drama plays out against the backdrop of a larger family dilemma. Matt – whose grandmother was Hawaiian royalty and grandfather a white missionary – also faces a choice over the future of 25,000 acres of pristine land Kauai, passed down to Matt and his flock of cousins by their native ancestors. Matt is sole trustee of the land but posed to accede to his family’s wishes to cash out to an out-of-state developer. The closest comparison to The Descendants in Payne’s catalogue is actually About Schmidt, another film about an aging man confronting the loss of his wife and trying to reconcile with an estranged daughter. However, Warren Schmidt’s faults were so discernible and acute that they vindicate his late wife’s infidelity and his daughter’s daffy search for emotional companionship. On the other hand, Matt remains as unspoiled as his family’s noble acreage, a man without context whose problems are the product of strictly external sources. He remains blameless for Elizabeth’s adultery largely because no explanation is provided beyond her own selfish desires. He describes himself as “a backup parent,” but this label isn’t self-critical so much as Payne’s way to insulate Matt from fault for Alex’s misbehavior and substance abuse and Scottie’s potty mouth. Even the decision to take Elizabeth off life support isn’t a difficult decision forced upon Matt, but instead one dictated by her living will, a choice Payne contorts into her final, selfish act. Throughout, a parade of the aggrieved – from Matt to Alex to Speer’s wife (Judy Greer) – take their respective turn at Elizabeth’s bedside hurling invective at her atrophying corpse. Although their insults are tinged with genuine pain, it’s still a spectacle that witty banter and Hawaiian folk music can’t make less macabre. In The Descendants, the only thing standing in the way of domestic healing – and a family night spent snuggling on the sofa to watch movies and eat ice cream – is a dead materfamilias. Call it the House of Payne.